After three weeks of wrapping, my garments have come in: I'm now the proud owner of a brand-new Mediven stocking and a Solaris Tribute nighttime garment! After three weeks of wrapping, my garments have come in: I’m now the proud owner of a brand-new Mediven stocking and a Solaris Tribute nighttime garment. Wahoo! I’ve had both open- and closed-toe stockings before but I didn’t find either to be particularly comfortable, so I decided to go a different route with my new one. I’ve never had a stocking quite like this – I love my new Mediven! My new Medi is closed-toe but each toe is separately enclosed, with sort of a “toe socks” aesthetic. Having each toe separate gives it that much more individual compression, which I need because my toes and forefoot are my most affected areas. 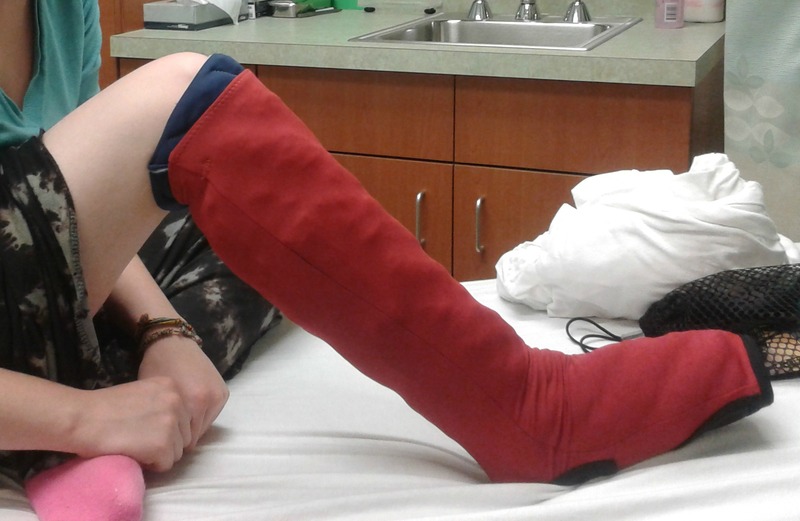 It’s super comfy, too – the team at GBMC and Caring Touch Medical did a great job measuring me for a custom fit. I’m looking forward to ordering these in a couple more colors when I go for my follow up appointment next week. For nightwear, I got a Solaris Tribute. I’ve had a Tribute before and so I’m already pretty used to it, although my new one is a little different: it’s colorful! Solaris offers the Tribute in a small variety of colors now – a simple pleasure for us lymphies – and I got mine in a pretty shade of navy blue with two different sleeves: one jade green, and one red. I also got a set of toecaps to wear at nighttime for some extra compression. So far so good although I’ve been taking it off in the middle of the night, in my sleep. Not quite sure what that’s about but I think after a few more nights of wearing it I’ll get adjusted to the new fit! I’ve been really consistent about wearing my stockings these past couple months, and getting new ones is strengthening my resolve to continue doing so. If I am able to wear my garment and have my leg wrapped during summer – the most difficult season for lymphies – then I can keep it up during the fall and winter! What types of garments do you have? Which ones do you prefer? You go, Alexa, with your brand spanking new garments! : ) You made out like a bandit with the treatment and support that you received. I really like the look of both of them and, yes, the color of the night garment is fun. I like the look of the toecaps and the silicone border on the Medi’s, too! In the past, I didn’t have luck with Medi’s but I think that my former therapist was trying to pawn off a smaller size then I needed and that’s a perfect way to experience pain and discomfort and a perfect example of when to look for a new therapist. Please give us updates on how both garments hold up and work over time. I’m a big fan of Jobst SoSoft kneehigh trouser socks and Jobst sheer thigh highs – closed toe. I also wear Farrow toe caps under my garments. So far they’re holding up fine. I’m loving life with the incorporated toecaps! They feel so much more comfortable and secure than my old open-toe stockings. I’ll have to look up the Jobst socks – are they custom fit? I am a newbie here and to lymphadema. Just diagnosed yesterday as a result of cancer treatment. It’s in my right leg – mostly my ankle and my upper right thigh. Do you have any advice / insights / guidance you can share with me about what to expect and the compression garments? My therapist gave me one today and I have no idea what to think of it. What are the options? Do they come in colors? Where do we buy them? How do I know my size? How will I know if it hurts (stupid question, I know). I am just starting out and I am so confused right now. Thank you in advance for any assistance you can provide me with. I’ve got genetic lymphedema seriously in my right leg, but also left leg. Fingers too. Just wanted to thank you for your post. I hadn’t seen the stockings out nowadays. I gave up on compression hose, they always would slide down & bunch around my ankle,due to how my lymphedema shapes my leg & foot. Then I’d wind up with bleeding blister. You know how we have to watch that. So tho I do compression pump regular, I’ve not worn compression hose for years. It looks really cute on you. If I go back in future to my clinic to try hose again, I def will be asking about colors & the toe sock look! I just found your page by accident while looking for images of Solaris Tribute night time garments. I too am going to GBMC for therapy. I’m on my third week. I have one more week to go. 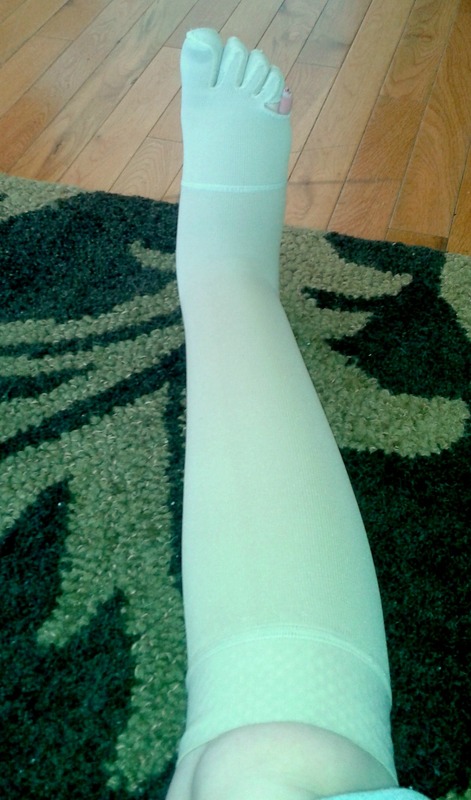 I just got measured yesterday for my compression hose. Congrats on being almost through your month of therapy! You’re in great hands – GBMC is amazing, and their team is so nice :) Will you be getting a Tribute night garment in addition to your compression hose? Best of luck as you finish up your treatment – you’re in the home stretch! !